By 7 AM, I was back at the aeropeurto. 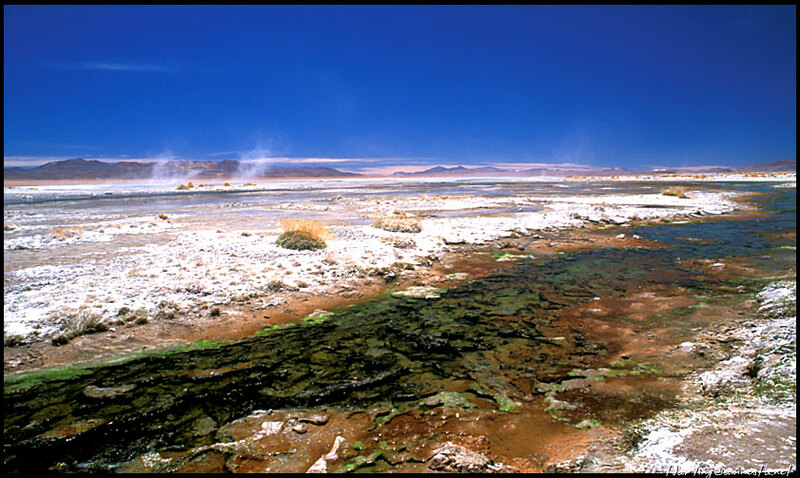 It's about a three hour flight to Calama, with a short stop in Antofagasta. The round trip ticket was a little over $100. Since the round trip bus ticket was $60 but took twenty hours each way, flying seemed like a better choice. 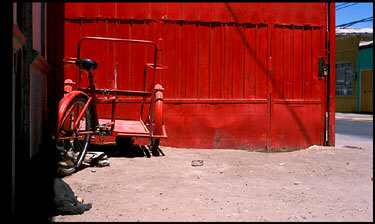 You walk off the runway and into the street at Calama airport. 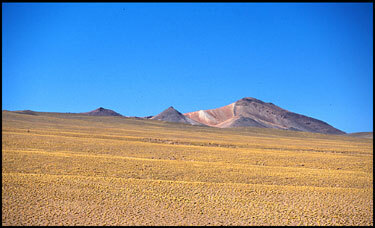 The whole region is a desert, supposedly the driest one on earth. From the airplane, I could see little shacks on the outskirts of the city, some roofless and deserted. I caught a $3 taxi into town and the taxista dropped me off at the Buses Frontera station. The center of Calama, which we drove through, is at most a couple stories tall, with signs hanging from most of the buildings like an old seaside town. Wires and cables are strung everywhere overhead and people and stray dogs fill the sidewalks and streets. It was very dusty and somewhat worn down. The bus station was a small fixture on a side street that looked somewhat like a garage. The sun was strong and white at midday and, with no lights on inside, you couldn't see for a couple seconds after stepping in. Buses leave for San Pedro de Atacama from there about every hour. It's a 1.5 hour ride for $5. 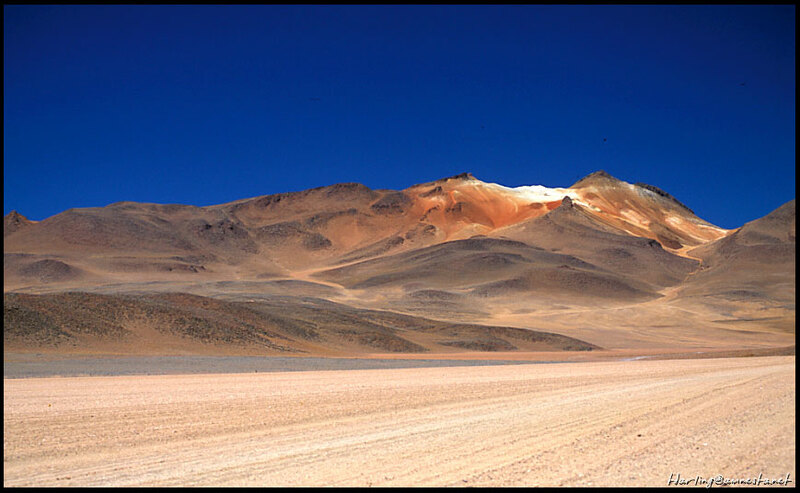 The bus passed through mile of desert of dirt, rocks, and dust in lunar landscape-type formations. There was no town or anywhere to stop until we got to San Pedro. SP is a small town that is first noticeable because of the greenery all around it. The main part of town is about four streets by four streets wide, if that. All of the streets are dust and the main couple have restaurants and travel tour offices. San Pedro is known as a good location to take single or multi-day trips out into the desert. There's lagoons, hot springs, geysers, and other interesting natural formations to see nearby. There's probably about an equal number of locals and backpackers there. I saw a restaurant on one of the main streets and walked in (here too, all the buildings were dark inside when you were standing in the sun). From the outside, especially considering the few rough looking locals hanging around, I half expected to walk into a western movie saloon in the middle of a gunfight. But surprisingly it was a very chic place that, for the most part, wouldn't have looked out of place in a trendy part of an American city. There was the odd touch of local authenticity though, such as two locals arm wrestling at the bar. Later in the day, I walked south down a long dusty road, Domingo Atienza. There were occasional houses, the odd car or bike going by, but for the most part it was very quiet and still. 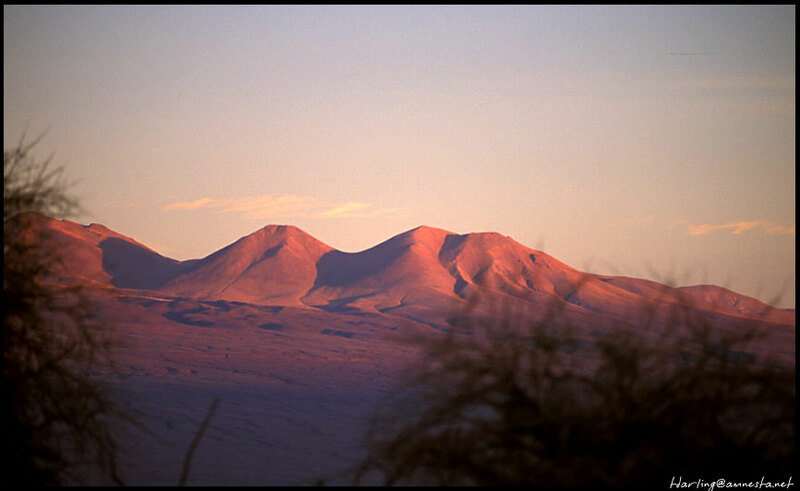 The sun was setting behind some small hills to the right, and to the left, the Andes were pink. At 8 AM, I went to the tour company's office that I had reserved a place on a bus to Laguna Verde with the previous afternoon. On the bus, there were a few Spanish and French students and I was definitely the only one who didn't speak Spanish. 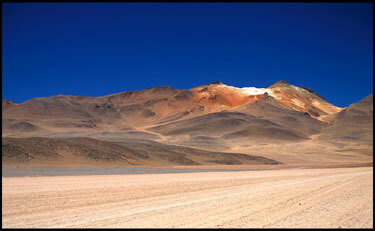 After about an hour at the Chilean border control station, we drove for another 45 minutes into Bolivia. Laguna Blanca was five minutes from the border and we stopped there. At that stop, we had to buy a $5 ticket to enter the park that all the lagoons are in. I signed in (you have to sign in with your name, nationality, and passport number everywhere), bought a ticket, and then walked off with their pen. It may have been my best idea so far on this trip. The bus driver came running after me, 'English!' (that's what he called me). He was always very defeated when he tried to talk to me since it was apparent that there was really little chance of any communication between us. I went back in to give the pen back and a group of the students jokingly clicked their teeth and "aww'ed" at my guilt and I slipped back out. But the upside of it was that one of the students, having heard I was English, came over to say hi. Her name was Olivia and she said she was born in Miami but had lived in Madrid all her life, except for the past couple months when she'd been a intern in Santiago. She was with a group of four other students from Spain and Chile. She said that they had their own 4x4 tour, but two of their friends who had signed up for it had been too tired to go. Since she was really nice, spoke English and Spanish, and being as I had absolutely no idea what I was doing, I asked to come along. 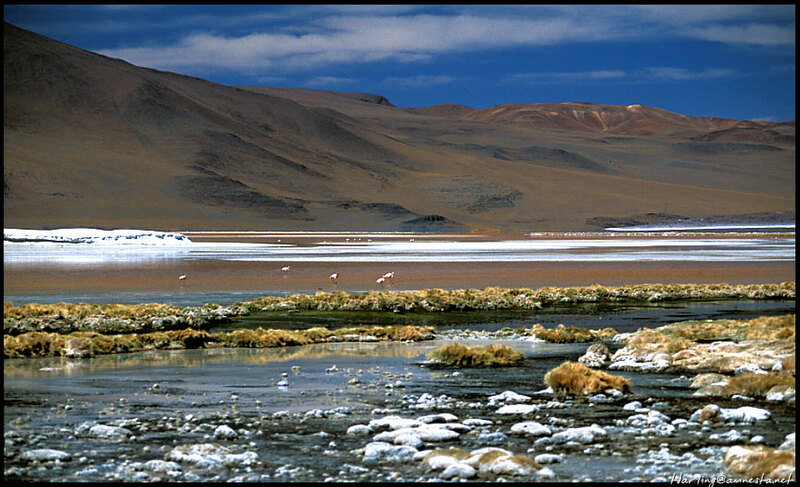 I had signed up for a short tour of just Laguna Verde (which would have ended at 1:30) but their group was going to a number of different lagoons further inside Bolivia and was getting back to SP at 8. Olivia talked to the bus driver for me and worked things out. At first she said there may be a problem since their tour cost more than what I had paid for. But after I explained that I hadn't actually paid anyone for anything yet, she laughed and everything was OK.
Everyone in their jeep was very nice. It was her and her boyfriend (both Spanish) and three Chileans that he had met: a husband, his just-pregnant wife, and her brother, Gilberto. I have to hope that I'm as friendly to random people who I meet. It seems that everywhere I go, I meet people who I never get a chance to properly thank. 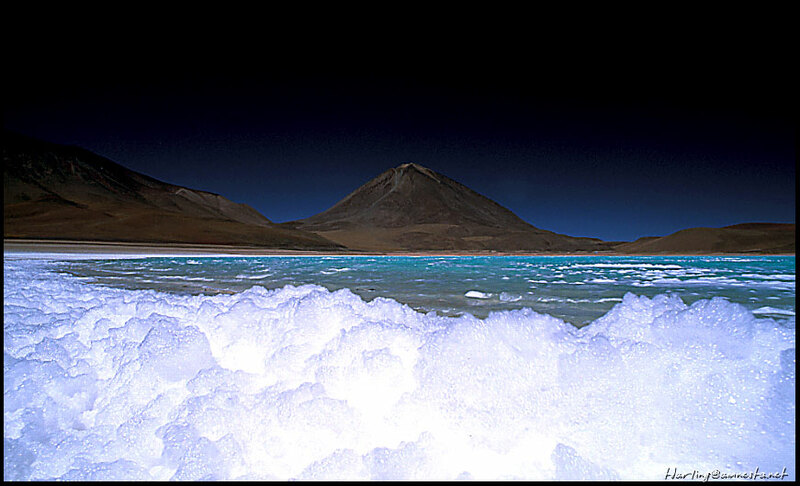 Right next to Laguna Blanca is Laguna Verde (at first, I thought Laguna Blanca was Laguna Verde since it, too, is green). With the bright blue skies and the tan mountain range above it, it was really incredible. The shoreline was a salty and frothy surf that got picked up by the wind occasionally and stained my shoes and camera. 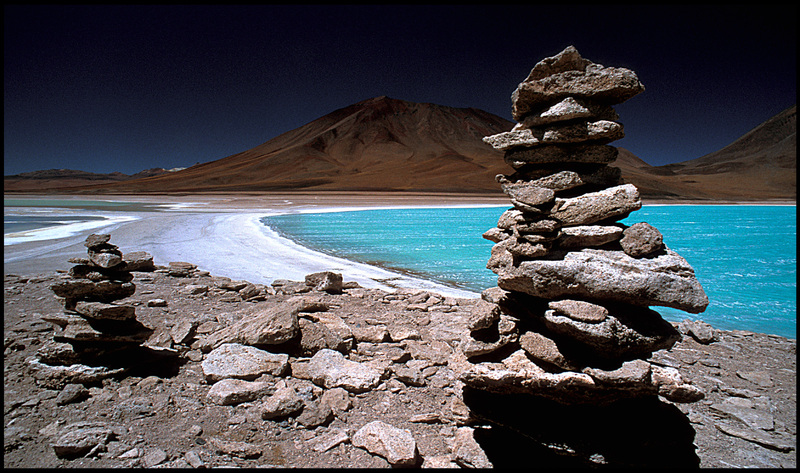 Laguna Verde was actually the reason I flew to the north of Chile and stayed in San Pedro. When I was first looking for things to see in Chile, I found a photo of the green lagoon and decided right away that I would go there. 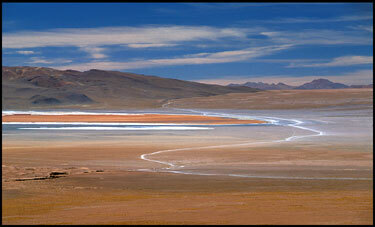 It took me a couple weeks to find out that you can stay in San Pedro and take a 4WD tour into Bolivia to see it. So luckily, my original idea of walking through the desert, crossing the mountains on foot, and otherwise ignoring the international borderline never had to be attempted. From Laguna Verde, we passed through miles of desert (the 'roads' were marked by clearings in the desert). It was magnificent, really. The mountains in the background were smooth and windswept and the sand and dirt stretched for miles untouched. We stopped at a spot where there were natural rock formations in the sand. Gilberto and I got out to photograph it (the others, claiming the wind was too cold, stayed in the jeep). He translated the driver's explanation for me. It's called the 'Dali Landscape', named after the painter, though apparently he never visited. 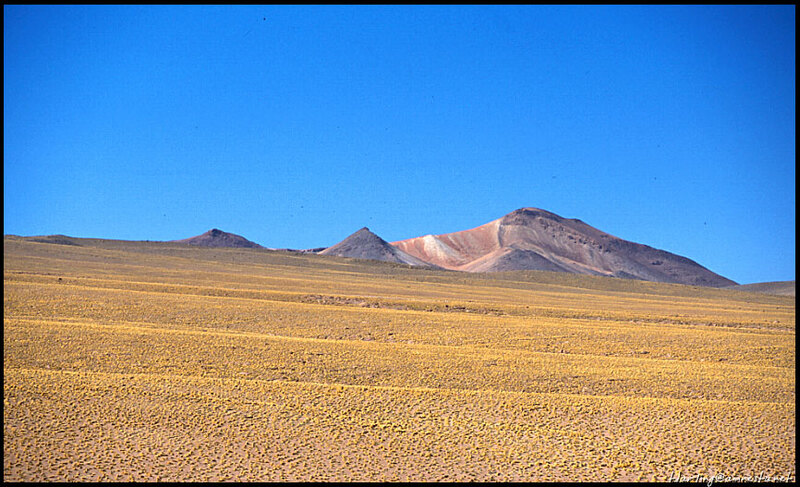 It was formed from ancient lava flows which have now solidified and eroded into a pattern of surreal monoliths. Further on, we stopped at a hot springs where the water was red, green, and blue in different places. The sun was strong, but the wind blew through the flats quite hard and at times it was very cold if you stood outside for too long. My camera lenses were constantly needing to be cleaned. But at the hot springs we stopped for longer than usual. 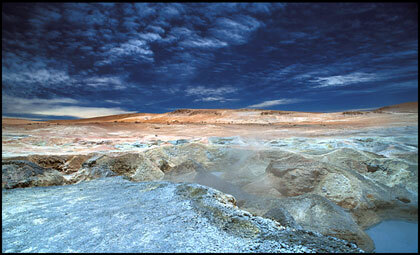 Beyond the springs was a geyser that, caught in the wind, covered the landscape with thick steam. The ground bubbled in places and it wasn't always clear where it was safe to stand. At a small building near Laguna Colorada, the driver left to go refill the gas tank. Looking for a bathroom, I walked into a room with a few Dutch and German travellers who were on the start of a three day tour. They had a room which had six beds in it with little room in between. I asked where the bathroom was (there were only four doors but I didn't want to accidentally walk into another group's room). "Go two streets over and make a left at the crosswalk-"
"By the train station?," I added trying to keep up. Those Germans thought they were so funny. They were sitting outside when I walked back and I started talking to them. They all found it very funny that I had met the group I was with at Laguna Blanca and just joined them there. "How did you get there though?" they wanted to know. "I mean it's not the sort of place that you can accidentally find yourself." They also laughed when I mentioned I hadn't paid anyone yet. The one girl in a chair to my left was staring at me into the sun with a look of such grave concern that is usually only used for stray dogs who are found having wandered thousands of miles from their home. I really didn't think I was that bad though. 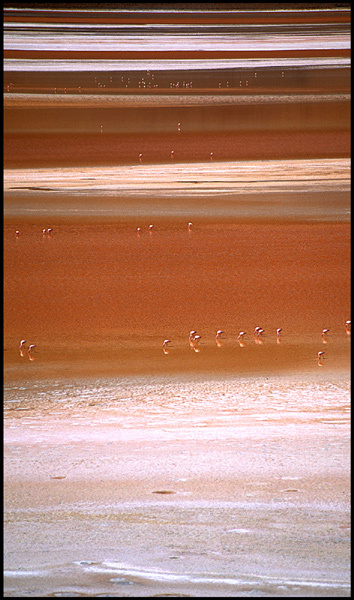 There are flamengos in Laguna Colorada. 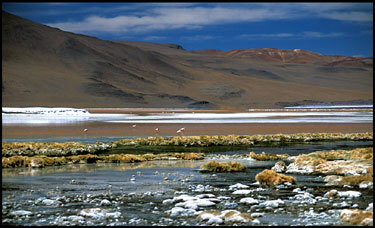 The water is red due to certain types of algae and plankton, as well as minerals like magnesium. At night, the flamengos flock to the hot springs that keep the lake warm to avoid the sub-zero temperatures. As we walked down the bank, Olivia was telling me about the violent protests that had been taking place in Bolivia in the past few weeks that finally, two weeks earlier, had caused the president to resign. She said the president, Gonzalo Sanchez de Lozada, had angered his citizens by his pro-U.S. free market policies that had so far failed to improve the conditions in the Americas' poorest country. The story sounded vaguely familiar but I had to (embarrassingly) admit that I didn't know much about it. I think that is the second great thing about travelling: it doesn't matter how smart you think you are, because when you are alone in the middle of country where you don't speak the language or know much about it at all, then bam - suddenly you know nothing. It really helps you keep a perspective on the world and who you are. I guess in that sense, you are a bit like a bright-spirited lost dog. Later, we were sitting at a table near Laguna Blanca drinking tea and waiting for our bus back to SP. 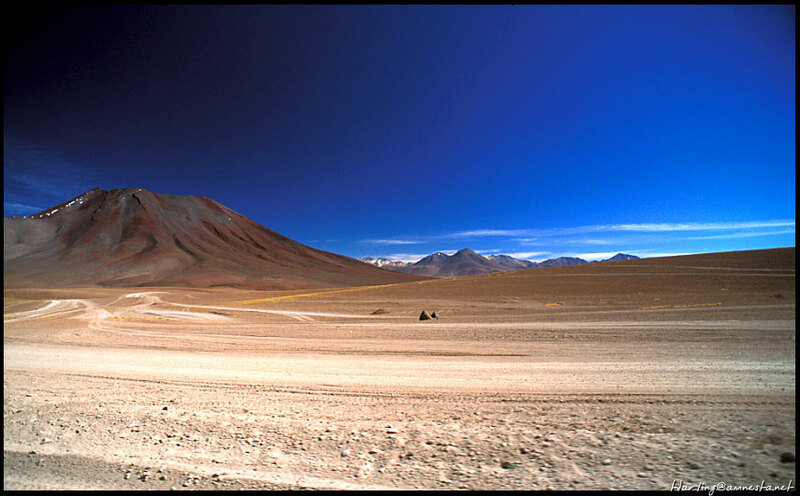 I had a headache and felt kind of nauseous, probably from the altitude, though the sun and the constant bumping of the jeep over the rocky desert hadn't helped it. Up there, the air was as thin as the country that breathed it. Olivia mentioned something about my black hair. I'm not quite sure what she was going for, but I interrupted: "oh, I'm blond." A combination of this news and it's forthright delivery made everyone laugh. "I just dyed it so I would look more like a local here in Chile." "You know there's a lot of blond Chileans," she replied, being a little blonde herself. They must have thought I was really crazy. She also added that I would stick out anyway because I am taller than most South Americans. I'd heard that suggestion before and it reminded me of the Fawlty Towers episode where Basil hears an Australian's very obvious accent and asks, "Oh, are you from Australia?". She says she hopes her accent isn't that bad. Not wanting to offend her, he says, "no that's not it- it's just that you're quite tall." These pictures are breathtaking and emotional. They make me want to go to experience the smells for myself. Your photos are incredible and your travel diary very amusing. Congratulation for the excellent work. i think that your pictures are awsome!!! i would really like to go to Chili, but i have no money. 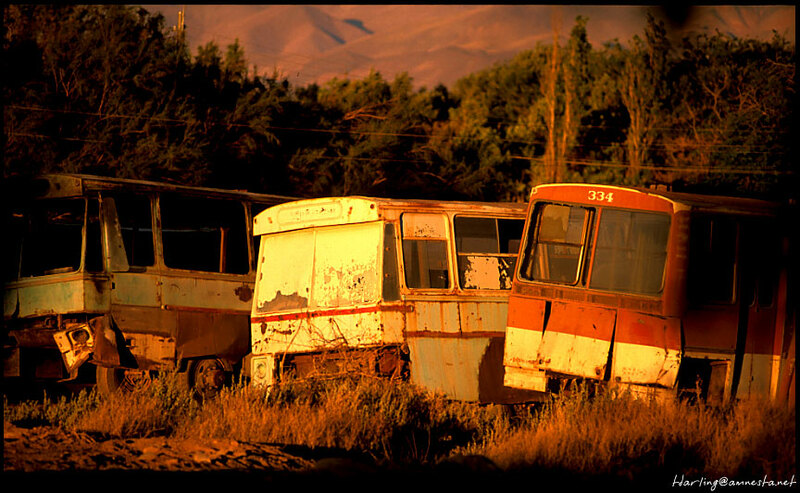 Its great to see someone finally capturing Chile's beauty. Fantastic pictures! They are gorgeous. You are a wonderful artist and photographer. My sister has been to Chile many times over the last several years and recently married a Chilean, but despite her attempts to get me to go to Chile, I really haven't been all that interested. But after seeing your photos, I think I have changed my mind! Thank you for opening my eyes.